Volunteer to help Wounded and Disabled Veterans with Free Handyman Services. “The Free Handyman” is a free handyman service for wounded and disabled veterans funded by donations of materials, labor, and cash, from contractors, grants, corporations, individuals, and social media fundraising sources. All services and materials are free to the veterans most in need. We are looking for Vets that need help around the house with this and that, (painting, clean-up, hauling trash, errands, moving furniture, fixing windows, drawers, electrical, plumbing, doors, etc…). Everyone has something they need fixed. Our focus is to proactively provide veterans with injuries, families of veterans in nursing homes, widows of veterans, veterans in wheelchairs, and veterans who earned the “Purple Heart” with Free Handyman services. Our goal is to treat all veterans with dignity, privacy and respect. We are seeking contractors and trades people willing to donate their services to wounded/disabled Vets. We need in-kind materials donations from public and private vendors. We are coordinating disabled veterans with handyman needs to volunteers and materials donated. We are developing relationships with Veterans groups. (VA Hospital, DAV, VFW , American Legion). We are working on a website that links volunteers to veterans and their handyman needs. Where the veterans can post Free Handyman help needed ads, and the volunteers can apply for the job posts. We are planning a “Put a Vet to Work” service on the website that helps unemployed veterans and contractors who are disabled veterans get paid work. We are developing a public, private, and social media networking program to pay for it all. Our goal is to prove the concept then develop a non-profit group with disabled veterans, that coordinates all of the activities. 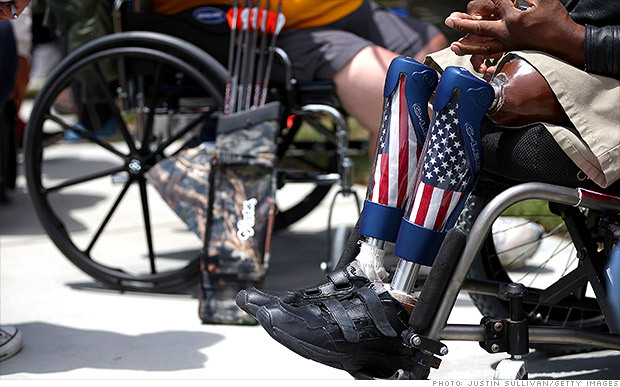 We need some “Stand-Up Americans” to help us, help some wounded and disabled Veterans! Ever volunteered at the VA?